The Natural History Museum in Dublin is the oldest museum in Ireland having been opened by Doctor David Livingstone (no less) in 1857. 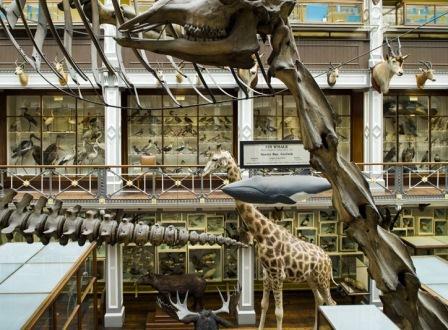 Known locally as the Dead Zoo, it has been a favorite of generations of Dubliners ever since. Dubliners are on first name terms with many of the exhibits, including Spotticus the Giraffe. Spotticus is is now happily tweeting away to his loyal band of global fans, following his recent makeover in the Netherlands. Seemingly, caught in a time warp, this cabinet-style 'museum of a museum' has just recently been revamped and reopened to the public. Having lain about in relative obscurity for years the Natural History Museum is once again poised to be a trail blazer of scientific research and discovery (as it was at the turn of the last century) having boldly embraced new technology which has seen its visitor numbers double in recent years. Innovative and free educational events and workshops for all ages are set to increase its profile and popularity even further. Visiting scientists and experts from all over the world have expressed a new appreciation and interest in the museums valuable collection of unique and rare items that are unlikely ever to be found again. Such as the huge skeleton of a fin whale, the second largest in the world which washed up in Bantry Bay in 1862 and the now extinct giant Irish deer whose antlers span an amazing 3.5 meters which was discovered in Monaghan and donated by the 4th Marquis of Bath in 1877.